Sky Ranch Tagaytay (also known as Sky Fun) is an amusement park located in Tagaytay, Philippines, a mountainous region just one hour south of the capital city of Manila. It's a great day-trip destination for small and large groups, and it offers many activities including the tallest ferris wheel in the Philippines, other carnival-like rides, horseback riding, mini-rides for kids, and several budget-friendly restaurants. Developed in 2013 by SM Land, Sky Ranch Tagaytay was the most "googled" tourist attraction that year by local Filipinos. The destination has proven itself to be one-of-akind, and it's estimated that more than 250,000 local and foreign tourists will visit there each year. 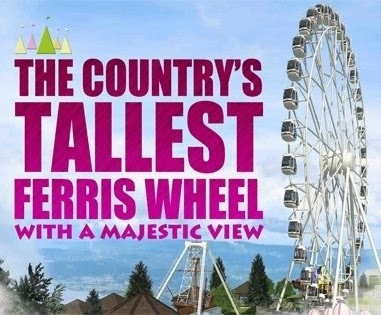 #1 - Tallest Ferris Wheel in the Philippines: It may seem exaggerated, but it's actually true. Sky Ranch features the tallest ferris wheel in all the Philippines. It's called the "Sky Eye" and it takes riders to a height of more than 200 feet (or 63 meters). When in Tagaytay, you are already 2,000 feet above sea level, so that combines to a total of more than 2,200 feet in the air. The ride lasts exactly 10 minutes, each cage is air conditioned, and about 4-5 people can fit in each cage. #2 - Amazing View: While on the ferris wheel during the day time, riders will be able to see an amazing view of the Tagaytay Highlands and of Taal Volcano. The view also overlooks Lake Taal, which is the country's third largest lake. On a sunny day, the view is to die for! 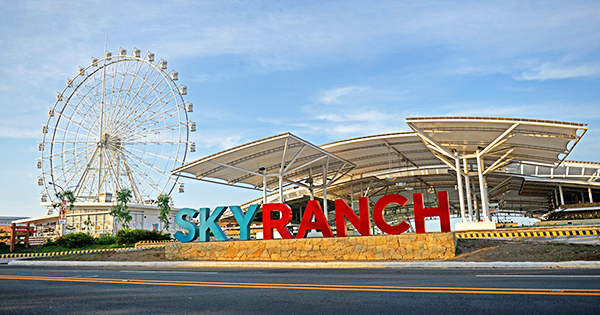 #3 - Multiple Attractions: One good thing about Sky Ranch is that there is more than just the ferris wheel. Visitors can also experience several carnival-style rides including the Super Viking, and they can go horse back riding. There are several mini-rides for kids including the Express Train, Mini-Viking Ship, a Carousel, and the Nessi Coaster. Even more, near these attractions, they will soon open a Science Discovery Museum for children. #4 - Great Location: From Metro Manila, it takes just one hour to get to Sky Ranch. Nestled in the Tagaytay Highlands, the region is very easily accessible from the country's capital city, and normally traffic is not too congested along the way. There are tons of nice hotels nearby, tons of restaurants, and tons of other activities such as hiking or zip-lining. #5 - Very Inexpensive: For an amusement park, the prices are quite reasonable. Admission to the park is just 100PHP per person (about $2.50 USD). This is the cost for every person to enter whether they will experience the rides or not. Once inside, each attraction has it's own price. The attractions for kids are usually just 50PHP (about $1 USD), but the attractions for adults range from 100PHP to 250PHP (about $2.50 - $5.00 USD). There are several affordable food vendors that are selling meals for an average of about 150PHP (about $3 USD). Sky Fun Amusement Park in Sky Ranch Tagatay is located right beside Taal Vista Hotel at Kilomoeter 60 Aguilnado Highway, Tagaytay City 4120.